Venum Knit Wear dress.....just in time for Christmas, grab this limited edition in holdiay colors! Another special Christmas edition, this time of the popular Isabel gown. Not to be missed, this formal will be the hit of the holiday season with sequins and satin and fur! 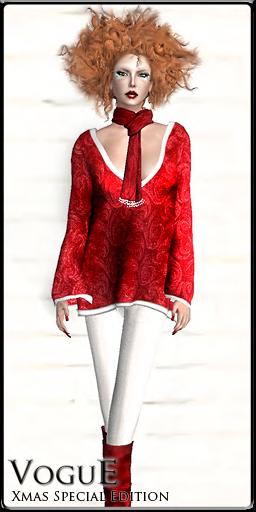 And the last, a vneck sweater, Suzan, complete with white leggings to go about your holiday business in comfort. Enjoy your holidsy season!